Appam with Veg stew (we call it ishtew in Kerala) or Egg roast is my favorite South Indian brekkie. 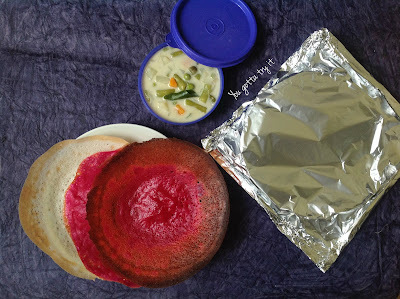 First time I am giving a twist to the regular appam recipe by adding some beetroot juice. Appam came out so delicious and now I have the confidence to try different flavors. Here is the recipe for a flavorful Beetroot Appam- my final recipe for #BellyNirvana ‘F2F Ka Lunch Box Campaign’ by Plattershare in association with FarmztoFamiliez. Unlike Dosa/Idli batter, I was not sure about the ready-to-prepare Appam batter, but the batter was so fresh and it was like homemade one. 1. In a bowl mix F2F Appam batter and sugar. Make sure the batter is at room temperature. 2. To the batter, add beetroot juice. Make sure that you add just the right quantity of juice to get the color. If you add more, batter consistency will change. Note: This batter is mildly salted, so add salt if required. I skipped adding salt. 3. Place the Appam pan on low heat. Once the pan is ready, pour a ladle full of batter and rotate the pan. Note: I used a non-stick Appam pan and skipped using oil. Also prepared a few plain Appams. 4. Cover and cook it for 1-2 mins till you get a brown crust. 5. Serve it with creamy vegetable stew or any gravy.